We’d love to welcome you to Trent Bridge as Specsavers County Championship cricket returns on Friday 5 April with the visit of Yorkshire. It's set to be a clash of the titans on the field, as Notts' Stuart Broad lines up against his England teammate, Joe Root. You’ll be able to take in the action in a venue which is frequently voted the best spectator experience in the country by cricket supporters, and one that holds a TripAdvisor Certificate of Excellence. Adults can enjoy a day of Specsavers County Championship cricket for £18, whilst seniors (65+) and under 21s can attend for £12. Junior tickets (under 16s) are priced at £9, with free entry for children aged under 3 on April 30 2019. - Click here to buy your tickets online. - Call the Ticket Office on 0115 899 0300. - Visit the Ticket Office in person, just inside the Dixon Gates near the Smith Cooper stand. Tickets purchased at this stage will be available for collection from the Ticket Office. Alternatively, you can use the print at home option. Feel free to purchase tickets from the Ticket Office on arrival at the ground. Window counters for this purpose are situated on Bridgford Road, adjacent to the Hound Road turning. If you can’t get here for the start of play, you can pop in after the tea interval to watch the final session at the reduced price of £5 for adults, seniors and under 21s and £1 for juniors (under 16s). - Opening hours are extended on matchdays. If you are keen to renew your Membership for 2019 ahead of the first home game of the season, we recommend that you do so in advance to beat the queues. You can do this online here or by calling the Ticket Office on 0115 899 0300 in advance of matchday. Should you need to renew on the first morning of the game, please be advised that the Ticket Office is likely to be busier than usual. In order to gain entry to the ground to secure your new Membership, please advise the steward on the Dixon Gates of your intention, who will happily let you proceed to the Ticket Office. Gates open at 9am, with the start of play scheduled for 11am. The morning session will take place between 11am and 1pm, before a 40-minute Lunch interval. The afternoon session will then take place between 1.40pm and 3.40pm (or when 32 overs remain, whichever is later) before a 20-minute Tea interval. The scheduled close of play is at 6pm. 96 overs are scheduled per day. Overs lost to bad weather can be made up in subsequent days, up to a maximum of eight per day. In the case of a 104-over day, times will be announced each day. 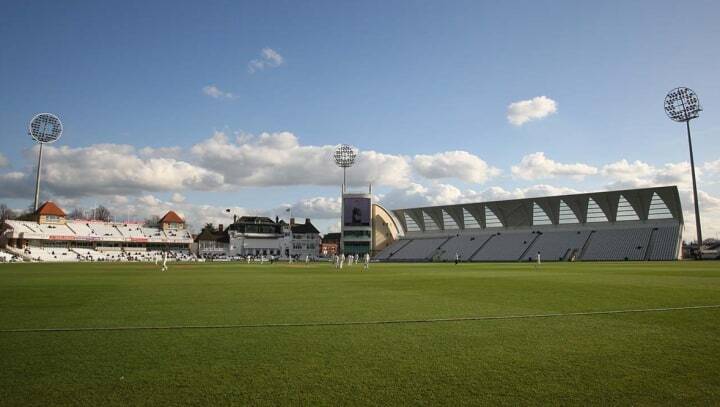 Trent Bridge Cricket Ground is situated in West Bridgford, in very close proximity to both Nottingham Forest and Notts County Football Clubs. Our postcode is NG2 6AG. As you approach, you can’t miss the circular floodlights. We are a couple of miles from Nottingham City Centre, a mile or so from the train station, and our city is blessed with one of the best public transport networks in the UK. We have gates through which to enter the ground situated on Bridgford Road, Radcliffe Road, Hound Road and Fox Road. You’ll need your membership card or match ticket at the ready to gain entry. Car Parking for spectators is available priced at £3 (£2 for Nottinghamshire County Cricket Club Members) at Notts Sports Ground (Lady Bay, postcode NG2 5AA). Alternative parking can be found in the Nottingham Forest Car Park, also priced at £3 or £2 for Members. Access for this can be gained off Lady Bay Bridge (NG2 3HF). Cyclists are able to park their bikes at the ground, in bike racks situated on the Smith Cooper Stand and Radcliffe Road Stand concourses, until an hour after close of play. Regular bus travel is available to the ground, with bus stops situated on Bridgford Road and Radcliffe Road. The nearest tram stop is at Nottingham Railway Station, and is a 15-minute walk from the ground. Regular bus services run between the station and the ground. Anyone travelling from outside the city to use the tram can also take advantage of NET’s free park and ride facilities. As an added incentive to take the tram, NET will be running its £2 return event ticket offer for all match ticket holders. To take advantage of the deal, fans need to select the Event Ticket option from the ticket vending machine before boarding the tram, and make sure they have their match ticket to hand for inspection. New for 2019, public Wi-Fi is available throughout Trent Bridge, which you are very welcome to use at your leisure. Simply connect to The Cloud from the available list of wireless networks and follow the sign-in or login instructions. Alternatively, the phone number to call is 0844 824 5000. Our friendly staff will, of course, endeavour to assist you should you struggle with the process of connecting your device to the Wi-Fi. However, we’re sorry to say that we’re not able to assist with technical issues. This can only be done via the process with Sky above. For souvenirs, replica shirts, bats, balls and training wear, our Club Shop is located in the Radcliffe Road stand, near to the reception entrance on the ground floor. Scorecards are available at the Ticket Office, Radcliffe Road Reception and Trent Bridge Shop at the nominal price of 50p. During the lunch and tea intervals, weather permitting, you'll be able to make your way onto our hallowed turf, with a bat and ball, and crack on with an impromptu game. Please note, only softballs are permitted. Ample toilet facilities are located, and well signposted, in various locations around the ground. Changing facilities are available in the Members’ Pavilion disabled toilets, as well as in the squash complex ladies’ toilets (access via the Ticket Office near the back entrance to the Pavilion), the William Clarke Stand ladies’ toilets, the Hound Road ladies’ toilets and the first-floor toilets on the East Wing of the Radcliffe Road Centre. Please feel free to ask any steward for directions. The squash complex changing rooms can be made available upon request from a steward as further baby changing facilities accessible to men, or as a quiet feeding area. The weather can take turns during the day, so please bring clothing to cover all eventualities. Wheelchair viewing positions are available in-front of the William Clarke and Smith Cooper Stands, as well as the Hound Road Upper, Radcliffe Road Lower and the top of the Smith Cooper Stand. Please feel free to ask your nearest steward or Member of staff if you have any questions, who will be delighted to assist you. The all-important ice cream van will, meanwhile, be located on the Smith Cooper Stand concourse. Additional bar facilities will be available at the Parr Bar in the TBI Courtyard, at the Hound Road Bar under the Hound Road Stand, and at the base of the scoreboard on the corner of the Radcliffe Road and YU Energy Stands. If you still wish to bring your own food & drink, please ensure that any food or soft drinks are in plastic or cardboard containers, avoiding alcohol, cans, glassware or metal cutlery. Designated smoking areas are assigned in various concourse areas, but smoking (including e-cigarettes) is only permitted in these areas, so please refrain from smoking in your seat.